I've been slacking off on my knitblogging lately, but I have certainly not been slacking off on my knitting. 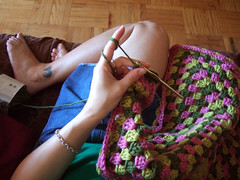 Well, actually, my crocheting. I haven't knit anything in months, but I've been hooking up a storm. 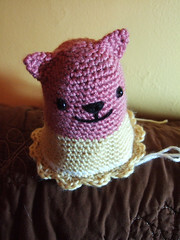 Of course, the only people aware of my prolificness are my flickr contacts and the fine people over at Ravelry. My recent slackoffedness is all Ravelry's fault, I tell ya. I start a project, fill in all the pertinent info such as pattern name, hook size, yarn, where I got said yarn, and whatever comments I have about the project. Then I upload flickr photos of my latest creation and voila! Instant online documentation of said project. Unfortunately, the ease of Ravelling has caused my slacking off on AngryKnitter.com. So, to set things straight, I will show you what I've been working on recently. 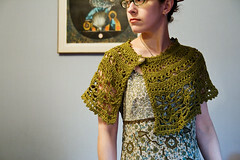 First we have the Chanson En Crochet from Interweave Knits Wrap Style. I made this to wear with a bridesmaid dress, but it doesn't really match and I'm sure they bride wouldn't approve my wearing it anyway. Though it did come out rather smashing. I love the color. I used Elann Sonata. I don't exactly recall why I bought that yarn in that color, it was originally for some other project, but it was the same gauge as the yarn called for in the pattern so I figured, what the hell. I had fun making it. There are a lot of different stitches and patterns on each row, so it's an interesting project. It's the first wearable I've ever crocheted (aside from hats and scarves) and it actually fits, although I haven't worn it yet. There is also a bittersweet aspect to this project. It was the first thing I made after my Aunt Nay died. She was a very talented and prolific knitter and crocheter and the only person in my family who cared about crafty things. I was so sad when I finished the wrap because I couldn't show it to her. I feel like that every time I start a new project or buy a new pattern book. Now I've inherited all her knitting paraphernalia and books. I guess someone has to carry on the family crafting tradition. I just found your interesting blog via Rav so I think that Rav can introduce one to a wider audience. It seems that if one is using a blog primarily as an organizing tool to keep track of one's projects, then Rav does make life easier. However what I enjoy about a blog is the unique synthesis of different ideas within one person's projects or viewpoint, whether that be the color of the sky or the current political climate. Surfed on in here via your profile on Ravelry. And in keeping with my thread on CLF, I've given your blog a "thumbs up" and got it listed on StumbleUpon, so other folks can hopefully surf on in and enjoy your blog. Kyle has informed me that this is what he wants for Christmas. As I am not about to pay $135 for a bearded hat with a mustache, I'm going to have to figure out how to make one on my own. Most likely I'll crochet it. And it's quite possible it won't be ready for Christmas. Anyhoo, The comments accompanying the blog post are funny. Especially this little exchange. Maybe if I bide my time some granny will come up with a pattern we can all use! More photos of the Bearded Hat can be seen here. I love this! I just found the link on Ravelry here http://www.ravelry.com/patterns/library/bearded-toque#. I got a copy of Crochet Me: Designs to Fuel the Crochet Revolution today and I absolutely love it. I'm mesmerized by the Mesmerize Sweater. I've never crocheted a sweater before, but I just might have to give that one a try. The Comfy Cardi is also very pretty. I was looking for a shrug-like sweater to wear to a wedding, but as the wedding is next Saturday, it's a little too late. The funny thing about this cute little cardi is that I actually own the dress the model is wearing it with. I got it on sale at Urban Outfitters and wore it to a wedding this June. I paired it with a pink shrug I knit from a Rowan pattern a couple of years ago, but it looks a lot better with the Comfy Cardi. Of course I have no photos of me wearing said dress and sweater since I was the one taking pictures at the wedding. Maybe I'll try my hand at one of these sweaters after I finish the kitty I'm working on. Kitty is on hold until I get some more fiberfill. I'm going to try to stop at Michael's while I'm out on Long Island tomorrow. Oh how I wish there was a suburban-style craft superstore in Brooklyn! Good to see you posting on AngryKnitter again! Suburban-style craft store? Maybe not in Brooklyn, but I learned that P&S reopened across the street from its old location. I think it's 355 Broadway. OH!!! Thanks for letting me know! I'm going to check it out. I miss that store so much. I can't do that, it's copyright infringement. You can get the book used for about $13 on Amazon though. Man, has it been a long time or what? I am such a lame craftster. I have no desire to knit or crochet during the summer, but now that it's over, I'm getting excited about yarn again. And it's not like it's even cold out (high was 85 today) but one of my cousins was expecting her second baby in September (Hello Nola!) and I have two first birthday parties coming up, so I decided to make some stuff. First off is Nola's blanket. It's just a big granny square, super easy, but I like the colors a lot. I used Lion Brand's new Vanna's Choice yarn. I really like the color palette Lion Brand came up with, muted yet vibrant. The yarn is super cheap and they sell it at the Pratt store, which is the only place to buy a ball of yarn near me with out walking for a half hour. My cousin loves orange, so the blanket I made for her first child was orange and pink, but I wanted to do something a little different for the new baby. I love pink and green, so I used Pea Green, Olive and Rose for Nola's blanket. I think it came out very cute, if I do say so myself. And I do say so myself. So there. 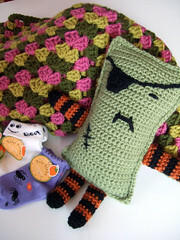 The other thing I made is a silly Frankenstein/Pirate doll. The pattern is from the Lion Brand site. They make you register to download patterns, but I think it's worth it; they have some fun free patterns there. Anyway, the toy is ridiculous, since it's basically a rectangle, but I think it will go over well with the one year old set. And since the party is next weekend, we picked up some silly Halloween socks at Target to add to the gift bag. Hopefully it will cool down a bit soon, so I can get back to making warm things. My needles and hooks miss me. Thanks. The blanket is really nice. I want one for myself now!